Wimbledon week means strawberries and Pimm’s! To coincide with the first week of the Wimbledon tennis championships (taking place just down the road from here and famous for strawberries and cream! 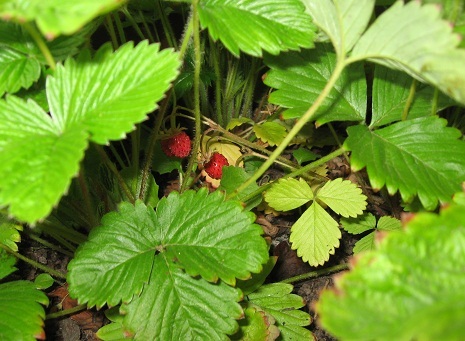 ), our first alpine strawberries ripened this week. They may be tiny, but boy, do they pack a lot of flavour. They’re so easy to grow, especially if bought as small plants, and they make an attractive addition in pots on the deck. They look fantastic sitting on top of a pile of cream or ice cream and they really do have the most intense strawberry flavour – the exact opposite of the huge, red, but insipid tasting specimens available year-round in supermarkets! And to keep up the Wimbledon theme, we’ve discovered that the ideal accompaniment to Pimm’s is not lemonade, as previously thought, but elderflower cordial! It’s less sweet and has a hint of vanilla. Just perfect! « Eating on the road, and have you ever been to Tebay Services?